The Penguins are heating up at the right time, winning their past 5 games to keep them in the conversation in the Metropolitan for the final two spots in the division. They'll put their winning streak on the line against the best team in the league as they travel to Washington to face the Capitals. And what once looked like a longshot is now coming clearly into focus. The Penguins looked like they needed to catch fire and get some help to move up in the division, and both are starting to happen. The Rangers' loss to the Sharks yesterday leaves them just 2 points ahead of the Pens with an extra game played, and the Islanders' loss to the Stars leaves them a point behind Pittsburgh with a game in hand. It'll be the 4th of 5 games between the Pens and Caps on the season, and Pittsburgh will look to even up the season series as they enter having gone 1-2-0 against Washington in the previous 3 meetings. It's been a breakout season for Evgeny Kuznetsov, and he's shown why the Capitals and their fanbase were patiently waiting for the Russian to leave behind the KHL and test himself against the best in the world. Kuznetsov has blown away the 11 goals and 26 assists he put up in his first full season in North America, and he leads the Capitals and is tied for 4th in the NHL with 73 points. 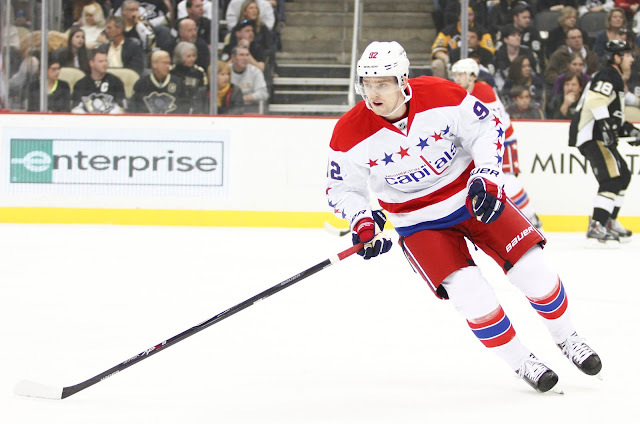 Drafted 26th overall by the Capitals in the 2010 draft, Kuznetsov slipped down the board despite his obvious talent as teams worried about their ability to sign the Russian center, but with the best Russian player in hockey the Capitals gambled on his talent and have been rewarded accordingly. That Russian player is, of course, Alexander Ovechkin, and he continues to be one of the best goal scorers across any generation. With 42 goals on the season, Ovechkin leads 2nd place Patrick Kane in the race for the Rocket Richard Trophy. If he holds on, it'll be his 4th consecutive goal scoring title and 6th overall of his career. The Russian superstar has hit both the 500 goal and 900 point milestones this season, and provided he doesn't miss a large chunk of time with injury he should be a lock to reach 1,000 points next season. The Capitals are 14 points up on the Dallas Stars for 2nd place in the league, and not surprisingly given their dominance this season Braden Holtby is leading the league with 43 wins - 7 more than Jonathan Quick, who is 2nd with 36. Although he's cooled down from a scorching start to the season, Holtby has still posted a respectable 0.923 SV% and 2.20 GAA. He's a big part of the reason why Washington has the 3rd ranked scoring defense in the league at 2.30 GA/gm to go with the 2nd ranked scoring offense at 3.16 GF/gm. They're a deep and balanced team who will be a tough out for anyone going up against them in the postseason. - Sidney Crosby matched his season high by registering a point for his 11th straight game yesterday against the Flyers, and he'll have a chance to set a new season best with a point against the Capitals today. The Penguins' captain has scored 6 goals and added 12 assists during his current streak.